Once upon a time, two frogs lived in different parts of Japan. One lived near the sea coast very close to the town of Osaka. The other made his home next to a beautiful stream that ran through the middle of the city of Kyoto. The two frogs lived far apart and had never met. Still, a strange thing happened. At almost the same moment both frogs suddenly decided they would like to see more of the world. The frog in Osaka wanted to go and see the city of Kyota. The frog in Kyota wanted to visit the town of Osaka. On a clear spring morning, both frogs left their homes to begin their journey. Each hopped along the way, and each found the trip harder than they planned. They did not know that a tall mountain stood between the two towns. Both frogs were determined travelers. They hopped and hopped and hopped. Imagine their surprise when they reached the top of the mountain and hopped right into each other. "Excuse me, if you please," said the from from Osaka. "I was trying so hard to get to Kioto that I did not see you." ""Oh, no," said the frog from Kyoto. "The fault is mine. I was trying so hard to get to Osaka that I ran into you." 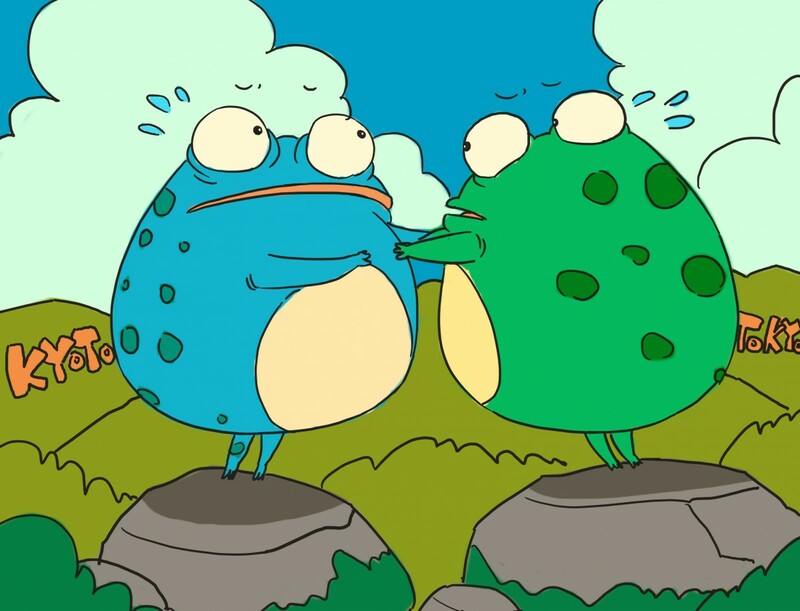 The two frogs each laughed when they heard where the other frog was going They visited and talked about their home towns as they rested before continuing on their journey. "It is too bad that you are not taller," said the frog from Osaka. "If you were, you could see my town from here." "It is too bad that YOU are not taller as well," said the frog from Kyoto. "You could see my city from here as well. Suddenly, both frogs had the same idea. "Why do we not help each other stand on our hind legs. Then we can stand and see where we are going." Both frogs held out their front legs and touched the legs of the other. They hugged each other tightly to keep from falling as they rose up on their hind legs. The Osaka frog pointed his nose towards Kioto. The Kioto frog pointed his nose towards Osaka. "Oh no," they both said at the same time. "Your town looks exactly like mine." They decided that it was not worth continuing their journey. "It is not worth the time to travel to Kyoto, said the frog from Osaka." "It is not worth my time to travel to Osaka," said the frog from Kyoto. "Both of our towns look just alike," they said again at the same time. Then they told each other goodbye and left to go home. It is too bad that neither frog remembered that their eyes were on the back of their heads. As their noses pointed forward, each frog saw behind them. Each of the frogs had seen the town from which he had come. The towns they thought looked like their own were as different as they could possibly be.